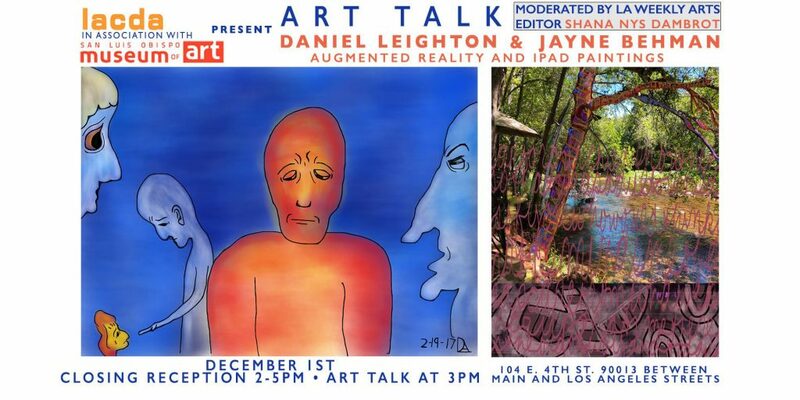 Join Jayne Behman and Daniel Leighton at LACDA on Saturday December 1st from 2-5pm for the closing reception and art talk for the “Electric Abstractions” exhibit that has travelled from the San Luis Obispo Museum of Art. The art talk begins at 3pm and will be moderated by LA Weekly’s Arts Editor Shana Nys Dambrot. Los Angeles Center for Digital Art, “LACDA”, presents “Electric Abstractions”, a traveling exhibition from the San Luis Obispo Museum of Art, “SLOMA”, featuring the works of Daniel Leighton and Jayne Behman. They are both California contemporary artists who use technology to create their work. Daniel Leighton is an Augmented Reality pioneer. His Augmented Reality iPad paintings focus on the importance of identifying, expressing and acknowledging emotions. He creates emotional portraits with simple lines and brilliant colors to capture complex states of the human psyche, while exploring the possibilities of technology and human emotion being harnessed for the greater good. Leighton adds Augmented Reality (AR) to his paintings by combining his backgrounds in filmmaking and computer programming. Using the Daniel Leighton Art + AR app, viewers can experience additional dimensions of Daniel’s AR-enhanced paintings. Jayne Behman substituted her brick and mortar studio with her iPad years ago to be able to create anywhere, anytime; without borders. It is on the technology “canvas” that she processes her Marks. Using a combination of Apps her paintings reflect her vision of a world reacting to change. Also, she just has some fun, seen in her banners and videos. Today works of art that are created using Technology are being embraced in the Art world as Fine Art. They are defining this time in history. Digital art, like any other art can evoke feelings, and bring about a connection to this world. The Los Angeles Center For Digital Art is dedicated to the propagation of all forms of digital art, new media, digital video art, net art, digital sculpture, interactive multimedia, and the vast panorama of hybrid forms of art and technology that constitute our moment in culture. Digital art defines the contemporary. They are committed to supporting local, international, emerging and established artists through exposure in our gallery. They have an ongoing schedule of exhibits and competitions, produce editions of wide format archival prints, and collaborate in the production of digital artworks in our studio. The are also involved with curating digital exhibits at institutions and festivals outside of the LACDA gallery schedule. LACDA has been supporting and exhibiting artists who use technology since 2004. This entry was posted in Art, Augmented Reality, Filmmakers/Filmmaking and tagged Art, Augmented Reality.